When the black eyed peas are ready and cooking in the pot, one of the dishes I know we will be making is my favorite Black Eyed Pea Salad. I always make sure when I cook a pot of peas that there will be enough left over for the salad. We have been making this salad for more years than I can could count and is one of our favorites. It is a great salad to serve as a side dish, take on a picnic, or even as a great dip. I am excited to share one of our favorites with you today. Chop all the vegetables and place in a very large mixing bowl, set aside while you mix the dressing. In a mixing jar, pour in the salad oil, vinegar, garlic powder, salt, pepper, sugar, and cayenne. Cover the jar and shake until the mixture looks creamy. Thanks so much for stopping by to visit with us today, I always look forward to your visits. Hope you have a fabulous week and come back to see us real soon, we will be on the porch shelling peas! I made a recipe very similar to this for a New Years Eve party. As you know black eye peas are suppose to be good luck. The recipe was a huge hit and I had an empty plate to bring home. I really like these kind of salads - veggie, healthy and very very tasty!! I LOVE black eyed peas and have a salad recipe of my own, but nothing like this one. Thanks! I'll be trying it. Yumm, Miz Helen this salad looks amazing! It's a feature on this week's Making Memories Mondays!! 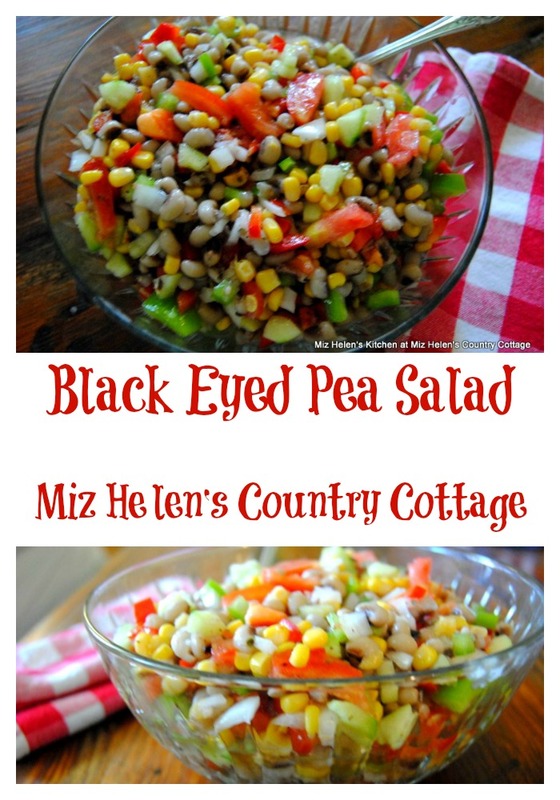 What a wonderful summer salad, Miz Helen! I love that the dressing is a little bit spicy - what a lovely balance of flavours in this delicious dish! Thank you for sharing it with us at the Hearth and Soul hop.